What Ms Prescott wrote about the real problem of affordable rental property in Paris (and in most of the big cities) is thoroughly accurate . In this would be funny comedy ,the real problem is in fact not even skimmed over;who do we meet in this movie? A wealthy obstetrician ,whose apartment is so large you could accommodate three families, and roommates who are lawyers,nurses ,and other homeless brothers.Does he know,Mr Desagnat ,that some people do not know where they will sleep tonight,and that these people have no money,no relations ,no family ,be they young or old?Showing this desirable dwelling has something obscene. That said ,the beginning promised a fable à la Frank Capra : a sullen Dussolier sunk back into his easy chair whilst the lilting Charles Trénet 's "Y'A D'La Joie" is heard;the contrast between the dark atmosphere of the room and the joyfulness of the tune provides the film with its only witty moment. 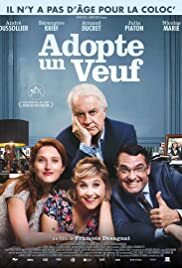 This movie,lauded far beyond its station, is part of the current "feel -good movies" which at best can renew the French comedy ("Le Goût Des Merveilles ") ,but at worst fawn on the politically correct audience:the last picture ,when all those nice people are gathered in Dussolier's stately house in the country will reassure everybody. Three screenwriters ,including the director,but none of them can supply acidity ,bite,savor,poetry ,anger,madness ,wit ,so comedy is always allowed to become coarse farce (the lawyer on the toilet seat ,a repetitive "gag" ).